August 2010: At the Whitecross Street art party to raise money and awareness of SHP (Single Homeless Project) charity the Craftivist Collective had a stall and artwork showing. 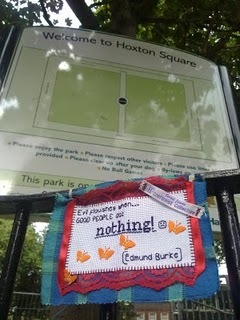 A lovely older man (wants to remain anonymous) came up to our stall very excited to meet us and said that he had stolen a Mini Protest Banner 2 years ago from Hoxton Square because he thought it was great and he couldnt find out who made it and put it up (he doesnt have the internet so couldnt Google the label). HIs banner said “there is more to life generic medicine online pharmacy than cool points”. Sarah Corbett who made the banner met our lovely supporter/thief at Hoxton Sqaure 14.08.10 to replace the banner with a new one. He really enjoyed telling Sarah the story of taking it off carefully with his Swiss Army Knife, sitting on the nearby bench with the banner next to him waiting to see if the craftivist came back and asked him what he had done so he could meet them and how he had asked all the local businesses if they knew of the craftivist.